Andrew Welch, FSO-DL, offered closing remarks at Graduation. 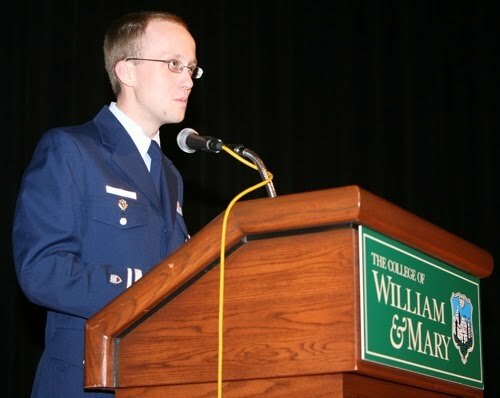 Other speakers included Chaplain Donald Troast (USN), James Clark, Flotilla Commander, Heidi Derby, District Captain, Harvey Langholtz, Faculty Advisor and Retired USCG Commander, and Taylor Reveley, President of the College. "He wrote of the Coast Guard, the world’s greatest humanitarian service, and he foreshadowed the Coast Guard Auxiliary. For though we wear a uniform, our mission is not one of guns and bullets, but rather one of saving those among us, protecting the environment around us, and ensuring the future for those that will follow us; about the devotion to duty needed to carry the spirit of American humanity from shore to shore, and to shores around the world. "In a world filled with so many challenges—hurricanes, floods, wars, stumbling economies—so many reasons not to believe in a bright future, I am comforted to know that there are heroes in our midst, Guardians among us. "And like the doctors and crew aboard the Naval Hospital Ship Comfort, currently plying the waters of Latin America, extending the hand of healing and friendship to those in need. "They—you—are my heroes, and that is the true value of the Coast Guard Auxiliary. As natural disasters and threats to the homeland, engagement abroad—the notion that preventing war is as important as winning war—continue to grow, so too will the need grow for Americans to answer that humanitarian call, to be citizen guardians, to be Auxiliarists serving in new missions, in so many ways. We are a service of business people, doctors, construction workers, teachers: Americans from all walks of life, who, when the workday is done, put on their country’s uniform and serve one another. We are America’s Volunteer Guardians, and under the devoted leadership of these students and those that will follow, ours will be an ever-evolving service that grows and thrives, meeting tomorrow’s unknown challenges with the cool and temperate perseverance in our duty for which our forebears have so long been known."